Liczba stron: 270 Jest to ujednolicona liczba stron, która ułatwi Ci porównanie długości książek. Każda strona Legimi to 200 słów. Curtis Newton, wizard of science, and his trio of Futuremen blaze a trail across the stars to forestall the coup of Dr. Zarro—leader of a legion of peril! The Captain Future saga follows the super-science pulp hero Curt Newton, along with his companions, The Futuremen: Grag the giant robot, Otho the android, and Simon Wright the living brain in a box. Together, they travel the solar system in series of classic pulp adventures, many of which written by the author of The Legion of Super-Heroes, Edmond Hamilton. Curtis Newton, wizard of science, and his trio of Futuremen blaze a trail across the stars to forestall the coup of Dr. Zarro—leader of a legion of peril! 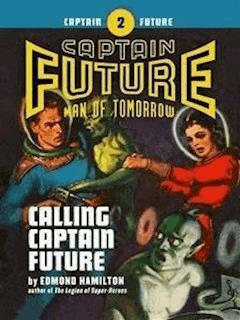 “Calling Captain Future” was originally published in 1940. No part of this book may be reproduced or utilized in any form or by any means, electronic or mechanical, without permission in writing from the publisher. THE big liner Pallas throbbed through space on its regular run from Venus to Earth. In the brightly lighted saloons of the big shop, throngs of men and women drank, laughed, talked or danced to the haunting music of the native Venusian orchestra. Up in the televisor room, “Sparks” yawned over his instruments. Then the youthful Earthman operator looked up quickly as the stocky first mate of the liner entered the room. “Call Earth Spaceport Four and tell them we’ll dock at ten sharp tomorrow,” the mate ordered. Sparks punched his switches, pressed the call-button. The televisor screen broke into light. In it appeared the chief dispatcher, on duty at Earth Spaceport 4. The dispatcher heard the report and then nodded. The televisor went blank as an untuned wave of incredible power crowded onto it. Then the image of a man appeared in it. “What the devil—” Sparks gasped. The man in the screen was an extraordinary-looking individual. He seemed an Earthman, yet his tall, gaunt, black-clothed figure, his enormous bulging forehead and skull, and his hypnotically burning black eyes, gave to his aspect some indefinable but startling aura of the superman. “Doctor Zarro calling the Solar System peoples,” he rasped in a deep, harsh voice. “People of the nine worlds, I bring you warning of a dreadful peril—a peril which your bungling, stupid scientists have not yet even discovered. DOCTOR ZARRO’S rasping voice deepened into a reverberating thunder. “I can turn aside that oncoming dark star, if I am given power to do so in time!” he shouted. “I alone! I am master of forces unknown to your ignorant scientists, for I am not really a native of this System at all. Who I am or what I am does not matter in this emergency. The figure of Doctor Zarro vanished from the televisor screen, leaving the operator and the mate of the Pallas thunderstruck. The dispatcher switched hastily off. Young Sparks looked excitedly up at the mate. “It didn’t sound like a stunt,” Sparks muttered uncertainly. He pressed switches, tuning in on many stations. A kaleidoscope of faces passed across the televisor screen. A hurricane of messages was being flashed back and forth between planets, concerning the startling broadcast of the self-styled Doctor Zarro. A buzzer sounded from atop the televisor set. “General Government Call!” exclaimed Sparks, his youthful face stiffening. He reached and touched a stud. An official of the System Government appeared in the televisor. He spoke with decisive firmness. “—and so the Planet Police have been completely unable to find the mysterious Doctor Zarro who made that broadcast, for his wave was of a strange new type whose source could not be located or analyzed. The crowd of chromium-miners and engineers in this little drinking-shop in one of the Twilight Cities of Mercury paid no further attention to the news bulletins. One of them, a big, bald Earthman miner, had started arguing with a little Mercurian engineer. “Look—there he is now!” yelled one of the crowd, pointing at the televisor. They stared stupefiedly. The newscaster had been crowded off the ether, and the tall, gaunt, burning-eyed image of Doctor Zarro had appeared in the screen. “You did not believe my warning, people of the nine worlds,” Doctor Zarro thundered, “you chose to believe your stupid ‘scientists’ instead. But now you shall see for yourself. The dark star approaching is now grown so large that it can be seen in small telescopes. The figure of Doctor Zarro vanished from the televisor, leaving the gathered miners and engineers gasping. “Another fake warning!” cried the bald Earthman. Presently, in the dark street of the metal Mercurian city, they were crowded around the small electro-telescope that was pointed toward a spot in the constellation Sagittarius. One by one, they stared through the eyepiece. They saw a tiny disk of darkness out there in the Milky Way. THE motley interplanetary group of men looked at each other. A chill of doubt had settled on them. They crowded back to the televisor in the drinking shop. A Government announcer was on. But the others looked worried. One of them, the younger Mercurian, voiced what all were thinking. They looked at each other in wild surmise. The bald miner shook his head. Like all modern people, he had always had complete faith in the scientists of the System. That faith was still unshaken, even though Doctor Zarro had proved the scientists wrong once. This particular Earthman might persist in his faith. Others, in various quarters of the System, were losing it rapidly. The speaker was an Earthman colonist of Saturn, a deeply-tanned man of forty whose face could not conceal his deep-seated worry. His wife and family and a few friends were gathered with him in his ranchhouse living room. Outside in the night stretched the vast plains of Saturn, with lanky Saturnians riding to and fro on their grotesque steeds in the light of the brilliant moons, herding the queer planetary cattle. “How do you know that even Doctor Zarro can do that?” demanded a Colonial Office clerk skeptically. “It means setting him up as a dictator over the whole System,” pointed out a neighbor Earthman rancher. The Earthman voiced what more and more people in the System were thinking. The scientists had been proved wrong once by Doctor Zarro. What if they were wrong again? The answer to that meant life or death for the System. MORE and more people were proclaiming that they believed Doctor Zarro’s warnings. And the mysterious prophet’s followers, his Legion of Doom, had appeared throughout the System. They all wore a black, disklike emblem on their sleeves and carried a similar emblem on the bows of their space cruisers. They sped through the spaceways of the alarmed System, mysterious couriers of the enigmatic Doctor. They switched on the televisor. Minutes later, the impressive figure of the doctor crowded on the screen. “People of the System, your scientists have told you there was no danger,” he shouted. “But where are those scientists now? Where is Robert Jons, the Mercurian astronomer who ridiculed my warnings? Where is Henry Gellimer, the astrophysicist who denounced me as a faker? Why have the great scientists who laughed at my warnings disappeared? As the dark prophet vanished from the screen, the Earthman rancher and his friends, stunned, looked at each other. “If those scientists have really fled from the System, that proves that Doctor Zarro is right!” cried the rancher. “We don’t know yet that it’s really happened—Doctor Zarro may be lying about it,” said the clerk worriedly. The harassed face of a System Government official on a System-wide hookup appeared in the screen, for the Government was now following each of Doctor Zarro’s broadcasts with reassuring statements. This statement was not reassuring. IN FRONT of the great tower that housed the System Government, in the city of New York on Earth, a vast crowd was demonstrating this night. “The President—and Council—must resign—and yield their power—to Doctor Zarro—and the Legion—till the danger is past!” the crowd was shouting in unison. James Carthew, the President of the System Government, stood at the window of his office, looking down at the surging, terrorized throng. His secretary waited anxiously beside him. North Bonnel, the young secretary, shook his head in troubled doubt. The door of the office burst open. The man who entered wore a dark uniform with silver stars on the shoulders. He was Halk Anders, commander of the Planet Police. The stocky commander shook his head. North Bonnel turned haggardly to his superior. JAMES CARTHEW’S pale face set. He looked out through the eastern window of the tower room, at the fun moon that was rising majestically in the heavens like a great silver shield. The secretary stiffened. His lips trembled. He turned abruptly, desperate determination written on his kindly, bewildered face. A half hour later, amid the frozen wastes of eternal ice at the North Pole, there blossomed a huge flower of flame as a great, dazzling magnesium flare was detonated. Far out in space that brilliant beacon was visible. Throbbing, winking and blinking, it cast its beams out through the void in silent, urgent appeal. Calling the great, glamorous foe of evil, to a struggle with the mysterious Doctor Zarro’s plot against misled humanity! A BARREN, deathly white waste stretched across the surface of the Moon. Beneath the glare of the blazing sun, the lunar plains rolled in eternal silence toward the colossal craters that towered like menacing jagged fangs. Upon this desolate world there was no air, no sound, and no human life—except in one place. Upon the floor of Tycho Crater glittered something like a round crystal lake. It was a big, glassite window set in the lunar rock. Underneath that window, excavated out of the soft rock, was the artificial cavern that was the laboratory and home of the most famous man in the System—Captain Future. The big laboratory of the cavern home was bathed in light from the window above it. Here loomed mechanisms and racks of instruments in bewildering array. Giant generators and condensers that could furnish limitless atomic power. Big telescopes and spectro-telescopes whose tubes protruded through the lunar surface. Chemical and electrical apparatus of bewildering complexity and design. All the crowded equipment of the System’s supreme master of science! The two individuals working tensely in a corner of the laboratory could be heard over the throbbing of a machine. “Time to shift the electron-flow, Simon?” the deep, clear voice of one was asking. These two were working with a spherical machine into which the great atomic generators were pouring vast power. One of the two was a big, red-headed young man in a gray synthesilk zipper suit. His lithe, broad-shouldered figure towered six feet four. His tanned, handsome, debonair face and flashing gray eyes had a rollicking humor in them that could not hide keen intelligence and deep purpose. He wore a big ring on his left hand—a ring whose nine jewels were motivated by a tiny atomic power engine that kept them moving slowly around a glowing central jewel. This ring, whose jewels represented the nine worlds, was known to the whole System as the identifying emblem of Captain Future, the wizard of science and the implacable foe of evil. Captain Future—or Curtis Newton, by the name so few knew—stood ready by the lever of the spherical machine. On a pedestal, watching the gauges of the mechanism, was his fellow-worker. This was Simon Wright, the Brain. He was just that—a living human brain that had no body. Instead, his brain was housed in a square, transparent serum-case, in the front of which was his resonator speech apparatus, on the stalks of which in turn were his lens-eyes. Curt Newton slammed down the lever. The throbbing of power into the spherical machine ceased. The red-headed scientific wizard undamped a door and opened it. Out of the mechanism poured a stream of white powder. “Aye, lad,” rasped the Brain. “This transmutation of elements is one of your greatest achievements yet.” Curt’s gray eyes twinkled at him. At that moment, there was a sudden explosion of angry, arguing voices from another chamber of the cavern home. One was a loud, Booming, mechanical-sounding voice. The other voice was hissing, sibilant and furious. Two creatures of unhumanly weird appearance entered the laboratory in answer to his call. One of them was a rubbery white android, or synthetic man. Otho, the android, was manlike in figure, his synthetic flesh having been molded into human form when he had been made. But his hairless white head and face, his slitted green eyes that were flashing now with anger, were not like any human’s. Nor could any human move with his wonderful quickness and agility. Grag, the metal robot, was the other disputant. Towering seven feet high, his mighty metal arms hinted incredible strength. The chief features in his bulbous metal head were his two photo-electric eyes that gleamed with living light, and the mouthlike opening of his speech mechanism. There was no creature in the whole System stronger than Grag, the robot. Perched upon Grag’s shoulder was a queer, bearlike little animal of inorganic silicate flesh, with strong paws, a sharp, inquisitive snout, and bright little black eyes. It was a moon-pup, one of the strange non-breathing creatures found on the lunar plains, who assimilated food elements by direct ingestion of the mineral they could crush in their powerful teeth. The little gray creature was contentedly chewing on a piece of copper now. “We humans like to have pets,” the robot defended. Despite his severity of tone, there was a fond twinkle of affection in the gray eyes of the big red-headed scientific adventurer, as he surveyed the robot and the android and the Brain. These were the Futuremen, the loyal trio of comrades who had fought and sailed around the whole System with him! These three weird comrades of his, un-human in form yet superhuman in abilities, had stood at his side in more than one great struggle out in the solar spaces. And, furthermore, the three had reared Curt Newton from babyhood to manhood, in this very cavern home on the Moon. Twenty-five years before, Captain Future’s parents had come secretly to the moon. Roger Newton was a young Earth biologist who dreamed a great dream. He hoped to create life—artificial, intelligent living creatures who could serve mankind. But his work was in danger. Certain ambitious men coveted his scientific discoveries and tried to steal them. Roger Newton had decided to seek refuge on the wild, uninhabited Moon. He had sailed secretly in a small rocket for the Moon. And with him had gone his young wife, Elaine, and his loyal co-worker and assistant, Simon Wright—the Brain. Simon Wright had been a famous, aging scientist who was about to die of incurable disease. Newton had by brilliant surgery removed Simon’s brain and transferred it into a special serum-case. Ever since, the Brain had been his most loyal friend. Newton and his young wife and the Brain had reached the Moon safely, and had built an underground home beneath Tycho Crater. There, soon after their arrival, a son was born to the man and woman—a boy whom they named Curtis. And there they began the work of creating artificial living creatures. GRAG, the robot, was the first creature created by Roger Newton and the Brain. Their second creation was not of metal but of synthetic plastic flesh molded into a manlike android—Otho, the synthetic man. These two artificial creatures, intelligent, strong faithful, showed Roger Newton that he had at last realized his dream. Then disaster struck. The evil plotters who coveted Newton’s scientific secrets had trailed him to the Moon. There was a fight—and Roger Newton and his young wife were slain, before the robot and the synthetic man killed the murderers. Dying, Elaine Newton entrusted her infant son to the care of the three unhuman creatures, Brain, robot and android. She begged them to rear him to manhood and implant in him a hatred of all those who used scientific gifts for evil ends—to train him as a relentless foe of an such as would oppress or exploit the System people. Simon Wright and Grag and Otho had kept that promise. They had reared little Curtis Newton to manhood. And the Brain, with its wonderful scientific knowledge, had so schooled him that he became a wizard of scientific ability surpassing his teacher. Grag, the robot, strongest of living beings, had fostered his strength until it was superhuman. And Otho the android, swiftest and most agile of all creatures, had taught him unmatchable speed and deftness. Thus Curtis Newton had grown to manhood on the lonely Moon, with his three unhuman tutors. When he had reached manhood, the Brain had told him the story of his origin, and had repeated the dying wish of his mother that he become champion of the System’s peoples against those who would oppress them. Curtis Newton had made his fateful decision, one that was to change history. As Captain Future, then, Curt had offered his services to the System President in the war against interplanetary crime. At first doubtful of this strange, redheaded young man, the President had in a desperate emergency called upon his aid. Captain Future and the Futuremen had demonstrated their power, swiftly, relentlessly. Since then, the President had called him time and again by the agreed signal. And time and again, Curt Newton and his three strange, loyal comrades had gone forth in perilous struggle. CURT was thinking of all that now, as he faced his three comrades. “Of course you were—you were such a bad job that they had to try again and make me before they were satisfied,” Otho jeered, with a mocking gleam in his slitted green eyes. “The signal!” cried the Brain suddenly. Simon’s lens-eyes had glanced up through the window overhead at the great green sphere of Earth. The cry of the Brain made the other three look up instantly. There upon the great cloudy green planet hanging in starry space, upon the white patch at the North Pole, a blazing pinpoint of light was pulsing and throbbing. Captain Future’s debonair tanned face had changed, grown grim. His nostrils were flaring, his brilliant gray eyes had something chill and hard as steel in them now. The Futuremen were gripped by the same strange emotion. The call from Earth! The tocsin that summoned these four to action! It was for this call that they waited through long weeks, living and working in the lunar laboratory. Captain Future’s voice rang like a silver trumpet summoning to battle. “Pick me up, Grag,” rasped the Brain’s calm, metallic voice. The robot picked up the handle of the Brain’s case. With the moon-pup clinging to his other arm, Grag started with hasty strides after Curt Newton and Otho. Ten minutes later a small ship shaped like an elongated tear-drop rose from an underground hangar on the lunar surface. It was the Comet, super-swift craft of the Futuremen, known far and wide through the System as the swiftest ship in space. Two hours later, so swift was its flight, the Comet screamed down through the stratosphere of Earth’s night side. Curt Newton dropped the little craft straight toward the great Government Tower that rose above all other structures of brilliant New York. The Comet came to rest on the truncated tip of the tower. As Curt and the Futuremen emerged, they saw in the plaza far below a great crowd that surged riotously against a line of Police. They hastened down a stairway that led directly into the private office of the System President. The three men in that office, Carthew, his secretary, and Commander Anders of the Planet Police, spun around startledly. “Captain Future!” cried Carthew, his voice shrill with relief, his fine face working as he came hastily forward. YOUNG Bonnel and the burly Commander stared, not without awe, at the tall young wizard of science and his companions. Curt Newton’s big figure radiated power and confidence as he stood there, the weird trio of the Futuremen behind him—giant Grag, the Brain he held, and the rubbery android.